I found this dress when I was running into Target to pick up a prescription and I swore to myself I was going to go in and out and that would be it but of course I saw this dress out of the corner of my eye and had to go check it out. Lately I'm drawn to anything olive colored. I just think olive looks so good with tan skin and gold accessories. Call me crazy but I'm definitely loving olive drab so be prepared to see more of it this summer! Ok, so back to the outfit; you may have seen this outfit on my Instagram a few weeks ago when I went out to dinner with some friends for a birthday celebration. I love how comfy this dress is, it's the perfect summer casual dress. It's cotton so it's flowy and casual and the cross back detail is a cute added touch. This time I decided to pair it this time with a pair of leopard wedges to dress it up a little but not too much and threw on some fun chunky gold jewelry. I topped off the look with one of my favorite summer fedoras! In love, I love Olive and leopard. Does Target EVER let you in and out, nope! haha. very pretty! love the bright lip, too. Cute outfit. Love the dress. Very cute & loving that big necklace! Great look... love your fedora! Love that cute sundress with the fun hat! Gorgeous! Love the back of that dress and that necklace! Perfect outfit for Summer! Hey I know that dress! Super cute! Love the necklace! Happens to me every time! Any Target run, for something as small as toilet paper, will no doubt result in a purchase of at least $80 or more. Love the dress! You make olive look so good! :) Loving that necklace, too. Happy Monday! I am seriously in love with those leopard wedges!!!! I love how you can make a $15 dress look like it costs $150......I love the necklace and the shoes. You are too cute! Love this dress. Love target. Bliss. Green: the perfect shade. Necklace: perfection and KILLER. Fedora: of course you can rock one. Cute look, lady! love the hat Pamela ! Love this outfit! The dress with that necklace are amazing! 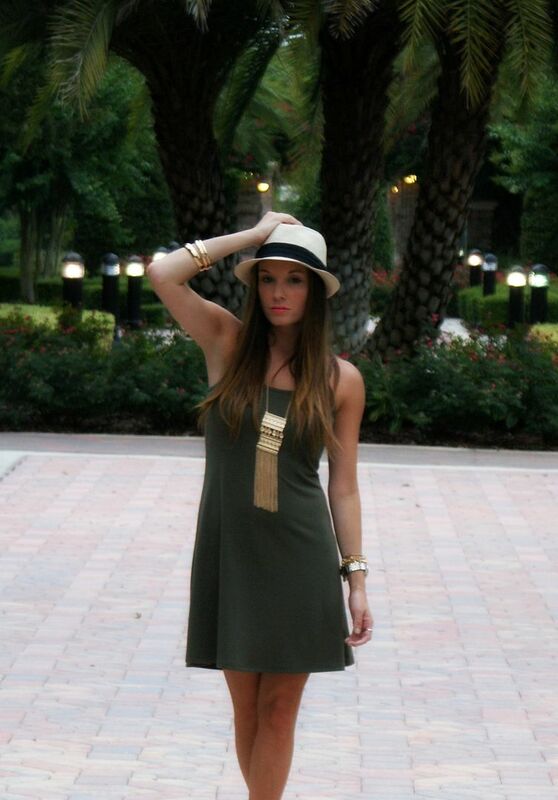 Olive looks AMAZING on you! Love it with the gold accessories! great look! I love the whole combo! Seriously such a great color on you!! I love that necklace and the panama hat is always my fave! I'm in love with that necklace bug time! Target strikes again! I seriously can't even make eye contact with their clothing section... TROUBLE! Love this color on you! I believe it is impossible to leave Target without buying at least one thing you didn't go in planning to buy. But this dress was a great purchase! It looks fab on you! And I love that you styled it with the hat and that gorgeous necklace! Love this necklace with the army green! Love this outfit! I like that you paired it with gold jewelry and a fedora hat!